I feel like I need to apologize to you all. Or at least apologize to the button on your pants. 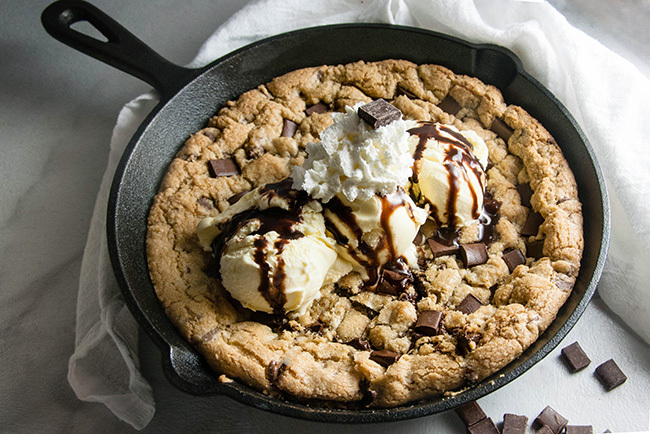 This skillet chocolate chip cookie will totally do your diet in. 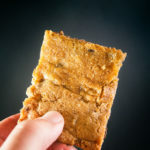 But, trust me when I say it’s so very worth it just like my salted caramel chocolate chip butter bars were. You know that meme that says nothing tastes as good as skinny feels? 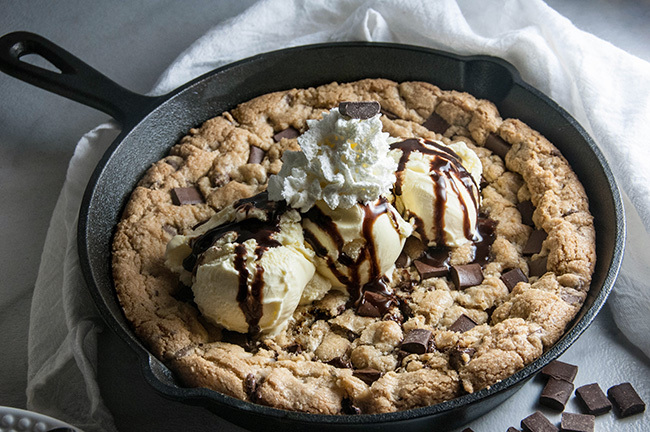 Yeah, well, I think this skillet chocolate chip cookie probably does. Full disclosure. Everyone has that one food that they just can’t let sit in the house. For us, it’s chocolate chip cookies. We love them, but we never make them. Ever. Because both of us would eat them round the clock. Seriously, at Christmas time when I have baked dozens of cookies, I have been known to wake up, pad into the kitchen, and eat a cookie before I drink my coffee. Ok, I lie. Maybe I eat multiple cookies before I drink my coffee. My husband is the same way. The amount of self control in this house when it comes to cookies is minimal. And seriously laughable. It’s like a good batch of chocolate chip cookies regresses us each into toddlers. So, needless to say, we baked this cookie, and intended to eat it slowly. Over several days for dessert. And, then I took pictures of the cookie. You know, to share with you all. Well, the cookie didn’t survive the photo shoot. Like not even a little. And I’m not sad about that. Not even a little. 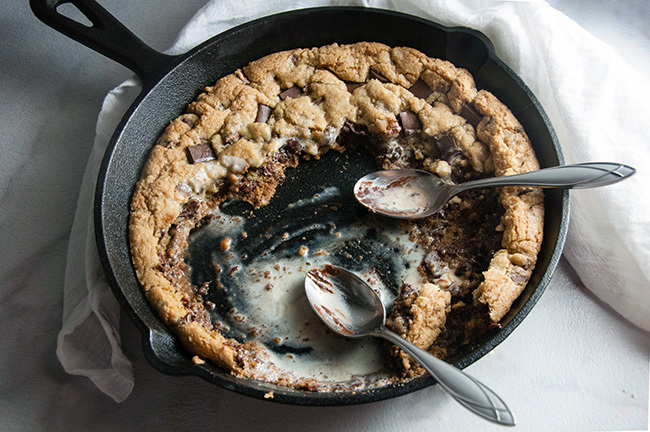 Because, you guys, this skillet chocolate chip cookie was total cookie perfection. Slightly crisp edges and the perfect gooey, slightly underdone and melty center. It just begs you to attack it with a spoon. Or a shovel. You know, anything that will get all that melty, chocolatey goodness into your mouth that much faster. And while ice cream isn’t necessary to top it off, it kind of is. 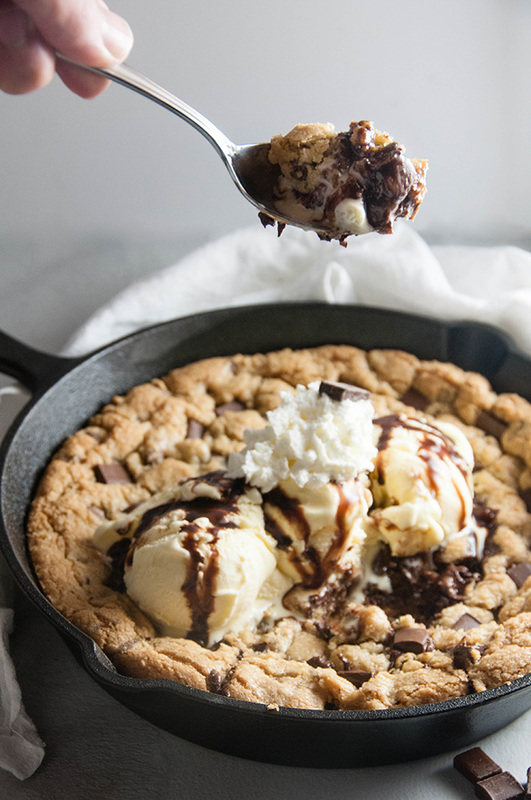 Because this cookie practically begs you to top it with ice cream so that the ice cream will melt into the cookie’s gooey center and create an explosion of total sugary gooey perfection. Lastly, a pro tip for all you parents out there: I was really thinking that we’d have to hide this cookie from the toddler or eat it either covertly locked into the bathroom or after she went to bed, but nope. I set out some chocolate chunk pieces and she didn’t even touch the cookie. I was seriously feeling like I was winning at life. Apparently, we also don’t share well when it comes to cookies in this house. Told you, cookies turn us into giant overgrown toddlers. Preheat the oven to 350 and grease a 10″ skillet with butter or shortening. While the oven is preheating, in a stand mixer cream together the butter, sugars, vanilla, and egg. Beat until the mixture is light and fluffy. In a separate bowl, whisk together the flour, salt, baking powder, and baking soda. Add about a third of the dry ingredients into the wet ingredients, and mix until combined. Repeat two more times with the rest of the dry ingredients. Mix until combined. Bake in a 350 degree oven for 15-20 minutes, or until the edges of the cookie are golden and the center is set but slightly soft. * We used an all purpose gluten free flour blend, but you can make this cookie with regular all purpose flour as well. 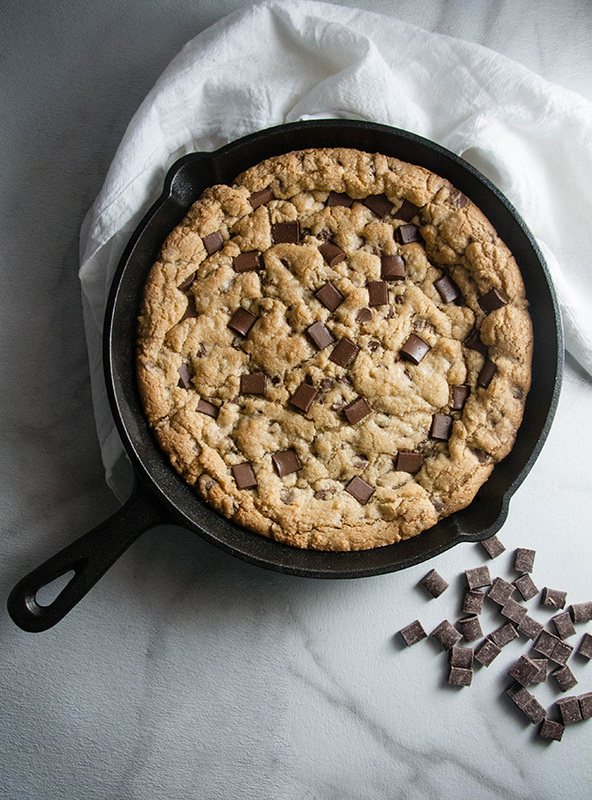 I don’t know how this is possible but I don’t know how I haven’t made a skillet cookie yet. These look delicious. I might steal your recipe and make one for myself. Hahahahaha nothing before it? If I had to pick a last meal it would be so many courses. Oh My Goodness! This looks heavenly. I’m afraid to try this because it looks very addicting. Oh wow… how delicious this looks. I wish I had some right now. Salted Carmel chocolate chip?! Don’t think it could possibly get any better. My faves all together. 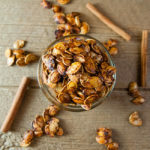 So excited to give this recipe a try! Looks pretty easy! Yum!!! Indeed. In butter bars. So good. Oh yeah I do this very rarely. VERY rarely. Because seriously, I like buttoning my jeans but I LOVE cookies. 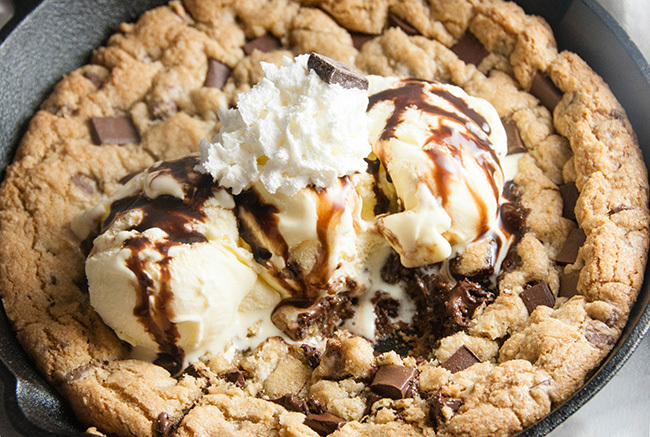 this cookie looks divine! And i love your commentary – especially on the serving size. ha! SALIVATING! This looks SO good! This looks so delicious! I am seriously going to have to give it a whirl. 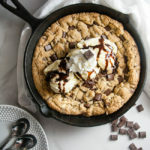 I’ve heard about skillet cookies before but never tried them! From the looks of this one, I think I have to try them now! Yum! OMG so good. Try it. Oh yummy!! This is something I always order at restaurants but have never thought to make myself. I need to try this soon! 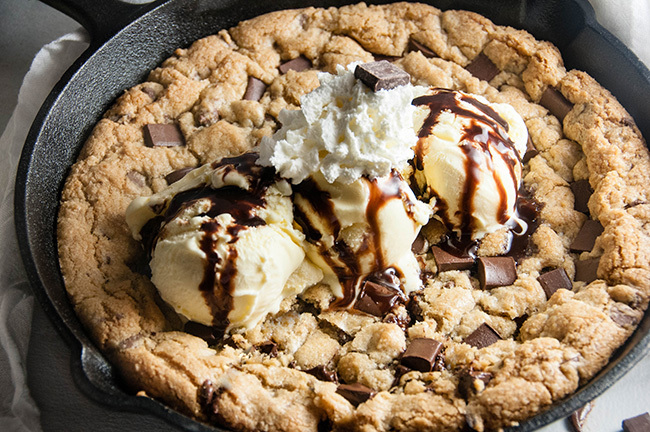 I’ve only ever had a skillet cookie in restaurants, so I definitely need to do this! 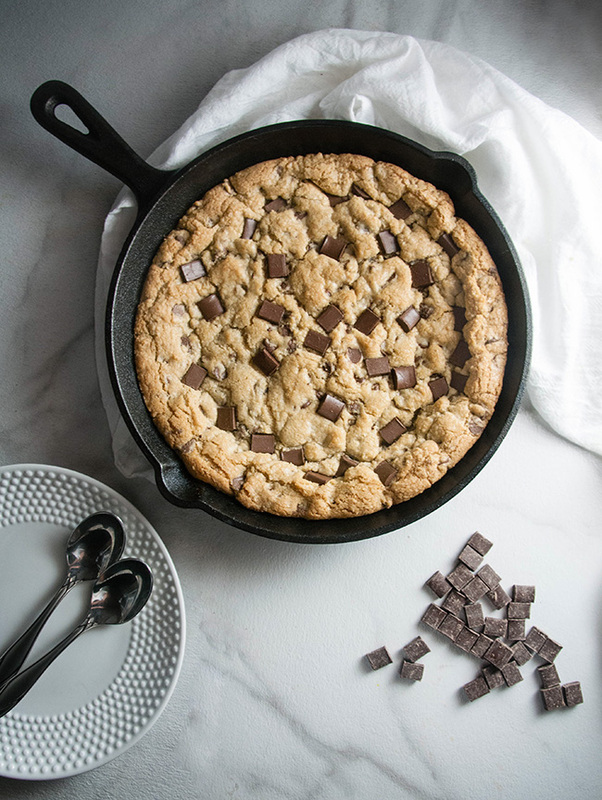 I also have no self control when it comes to cookies haha, so I’ll be sure to get a smaller pan! Hahaha we have several sizes of cast iron pan and I (by I, I really mean my waistline) wanted to make it in the small pan. I was vetoed by my husband. I need this in my life. Like, right now. This looks like a restaurant quality dessert! I can’t think of anything more delicious, especially paired with vanilla ice cream. I will definitely be making this on my next “cheat day”! That is the most perfect meal I’ve ever seen! Lol, I love that you call this a meal. I totally agree! Cookies don’t last long in your house either, huh? Good to know I’m not the only one who eats cookies BEFORE I have my coffee. 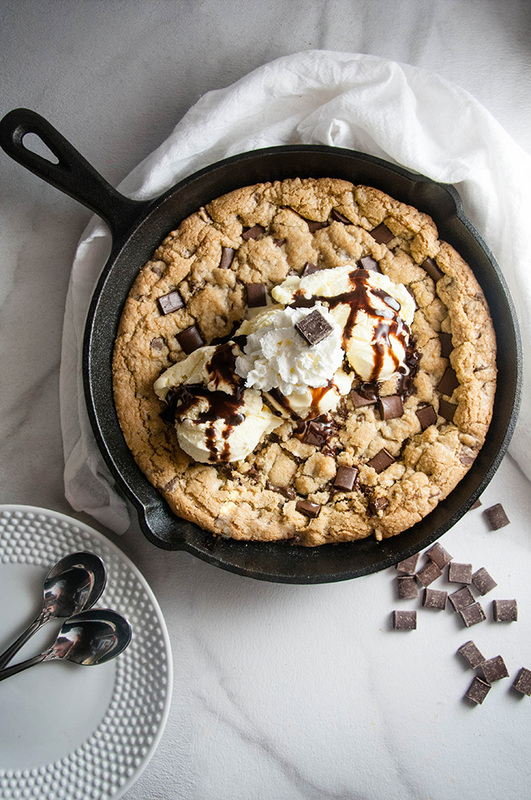 🙂 So, your skillet cookie looks amazing! Chocolate chip cookies are the best. I am for sure making this in the near future! I need to invest in a full sized skillet. So many uses for it. I only have a super tiny one now. 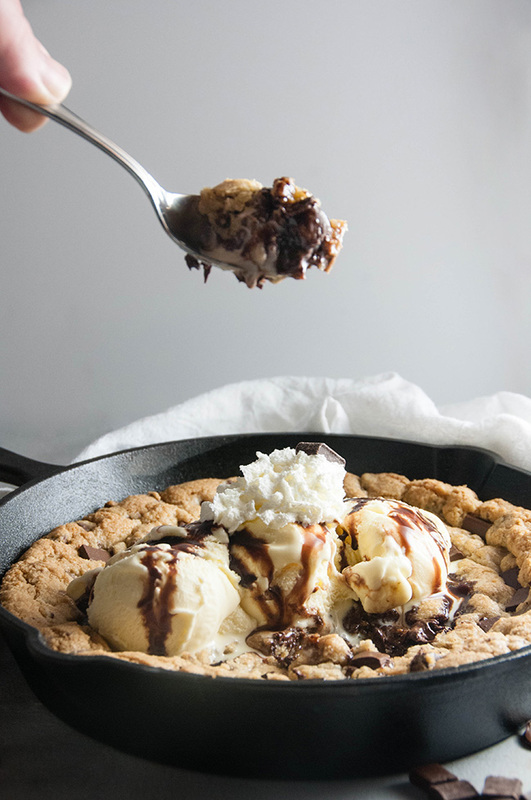 Oooh, this looks like heaven in a skillet! 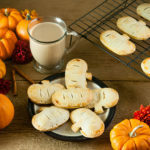 I’ve never made one of these before, but you’re really making me want to get in the kitchen and get baking 🙂 Great choice with the ice cream too – vanilla ice cream and warm cookies is my weakness! 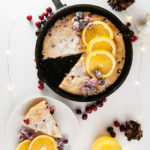 I love my skillet but I never think to bake with it. This look amazing and something I should be doing – like now. haha I’m just worried I’d hoard the entire cookie to myself!